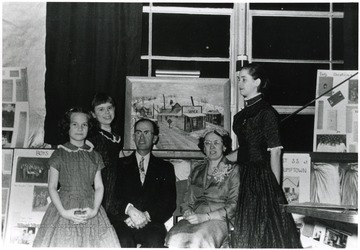 Group portrait of the Mary Behner Christopher family in front of a painting of the Shack. 2. Sanitary Milk Bar, Morgantown, W. Va.
Sanitary Milk Bar, Morgantown, W. Va.
A mother and son purchase ice cream at the Sanitary Milk Bar in Morgantown, West Virginia. 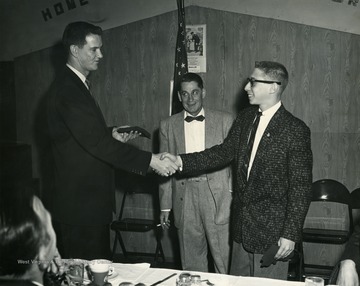 William Barker, foreground, and Emory Yauger are pictured. 3. 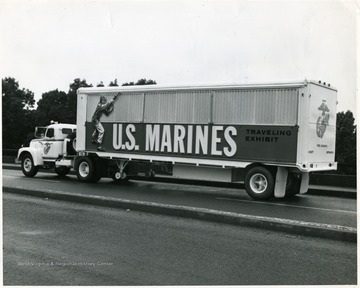 United States Marines Traveling Exhibit in Morgantown, W. Va.
United States Marines Traveling Exhibit in Morgantown, W. Va.
Defense Department Photo (Marine Corps) No. 403253. 4. Setting Up Displays at the Wesley Church Youth Center Hobby Show, Morgantown, W. Va. Setting Up Displays at the Wesley Church Youth Center Hobby Show, Morgantown, W. Va.
5. Labor Temple Men, Morgantown, W. Va.
Labor Temple Men, Morgantown, W. Va.
Two men shake hands at the Labor Temple. 6. 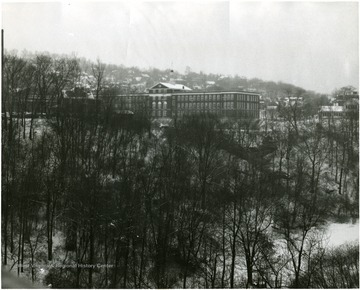 Morgantown High School, Morgantown, W. Va.
Morgantown High School, Morgantown, W. Va.
A view of Morgantown High School through trees in the winter. 7. 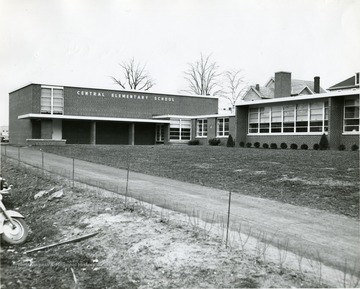 Central Elementary School, Morgantown, W. Va.
Central Elementary School, Morgantown, W. Va.
8. Members of the Brooke County Bar Association, Weirton, W. Va.
Members of the Brooke County Bar Association, Weirton, W. Va.
Group portrait of members of the Brooke County Bar which was taken in the William Country Club in Weirton, West Virginia. Seated left to right: Edward (Ned) George; C.K. Jacob; Judge JJ P O'Brien; and J.A. Gist. 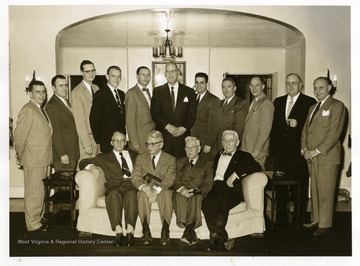 Standing left to right: James Park McMullen, Jr. Aloused C. Carman; Richard W. Barnes; Herman Rogersou; Hazlett Rodgers; R. E. Hagberg; Charles D. Bell; Clarence Spitznogle; Graham Nightingale; Walter E. Mokau; and Abraham Pruisky. 9. 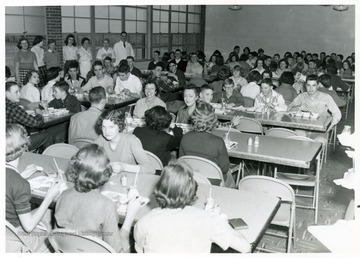 Webster Springs High School Cafeteria Ramp Feast, Webster County, W. Va.
Webster Springs High School Cafeteria Ramp Feast, Webster County, W. Va.
"Alumns serving Rampfeast, 1956, to buy cafeteria equipment. Sale was a success. Standing by the wall, left to right, are girls who served food. Barbara Cogar, Connie Ware, Frances Gladwell, Maxine House. 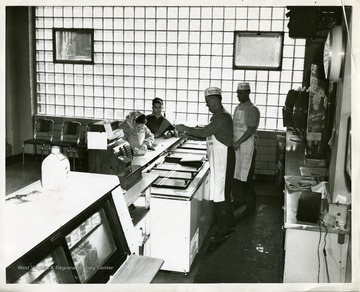 Cooks who prepared food are Lafa Hosey, Mrs. Olive Nichols, and Robert G. Andrick who was manager of the cafeteria from 1955 to 1960. At the center of the room is Miss Aretta Summers and Mrs. Ruth Morton Himes, both reflecting appreciation for the new high school building. They were teachers of whom the school was proud." 10. 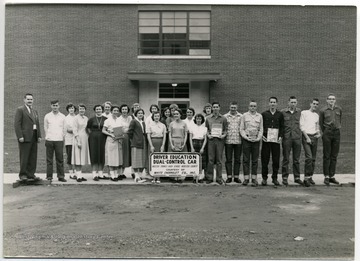 White Springs High School Driver Education Class, Webster County, W. Va.
White Springs High School Driver Education Class, Webster County, W. Va.
Driver Education Class, 1956, Webster County, W. Va. Front Row Pictured Left to Right: Robert Andrick (Instructor), Elbert Gum, Arvilla Pugh, Margaret Shipman, Mary McCoy, Ania Schrader, Aaron Chapman, Bill Gibson, Joey Friend, Bill Hull, Roger Hall, Raymond Gregory and Bernard Lewis. Back Row Pictured Left to Right; Willavene Riffle, Norma Shears, Shirley Eubank, Mava Helmick, Jane Wilson, Molly Pulliam, Carolyn Foreman and Macel Lowther. 11. 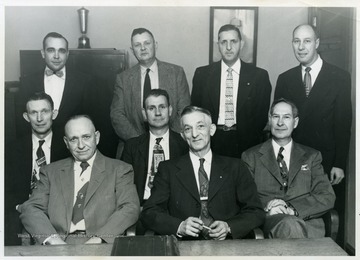 Board of Education and Supervisory Staff, Webster County, W. Va.
Board of Education and Supervisory Staff, Webster County, W. Va.
Board of Education and Supervisory Staff, 1956, Webster County, W. Va. Pictured sitting, left to right; Howard Fletcher, Lawrence Berry, Orvak Cogar, Leslie B. Robinson (president of the board), and Dock Cutlip. 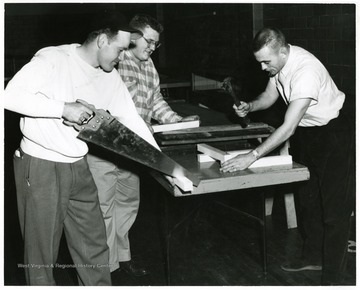 Standing; Fred Berry (supervisor of instruction), Ed Cunningham (supervisor of transportation, buildings and grounds), John Shock (superintendent of schools), and C. Paul Cutlip (assistant superintendent of schools). 12. 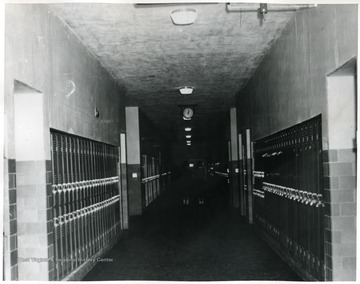 Hallway in Webster Springs High School, Webster County, W. Va.
Hallway in Webster Springs High School, Webster County, W. Va.